ADVOCARE, Why I'm on Board! Life is crazy sometimes and we all have a lot on our daily to-do list, some more than others. Things that pay the bills and keep our families running smoothly tend to be at the top of the list, while spending extra time at the grocery store, farmers market and in the kitchen tend to fall towards the bottom. While it is my goal as a personal trainer to help you move those tasks higher up the list, I completely understand that sometimes we just need a little extra help in the area of nutrition. This is why I have chosen to join the Advocare Team. They offer a wide variety of products from multivitamins and their 24 Day Challenge (a comprehensive supplement and nutrition plan) to protein powders and skin care products. PLEASE UNDERSTAND that these are supplements, meaning that they are intended to supplement a clean and healthy diet. They should never be relied on as the main source of anyones diet. For example, I keep a shaker and a meal replacement on hand at all times for those instances in which it is a better option than pulling into a fast food chain or eating the pizza that was provided at a group lunch. It is important to research the ingredients in the products that you use regularly and beware of any known side effects. For example, the Spark Energy Mix contains sucralose (Splenda). This is known to cause headaches and stomach issues in some people as it is an artificial sweetener, and in MY OPINION should not be your main source of energy. Green tea with lemon would be a much better option on a regular basis. But having a Spark packet on hand for those times that you can't muster the energy for a workout or as a better option than the artificial syrup filled flavored coffee is perfect. Now that all of my "disclaimers" have been expressed, I want to say that I am very excited to be able to incorporate these products into my clients regimens. In the end, we are all looking for results and if a 24 Day Challenge will get you on your way to reach your ultimate goals, I support it 100%. As long as they remain a supplement to your diet and in the end they are used to fill in any gaps that you may have, you are using the products properly and will have great success. 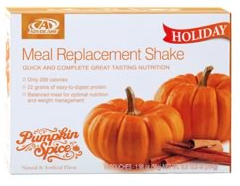 Now who's down for some Pumpkin Spice Meal Replacements? Who hoo!! Please visit my Advocare Site anytime to browse products and NEVER hesitate to contact me with any questions!